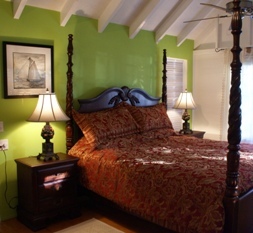 Located on Antigua’s north coast in a cul de sac at Hodges Bay just five minutes away from Dickenson Bay, Jabberwock Beach, Kitesurf Antigua, Cedar Valley Golf Course and The American University of Antigua, and ten minutes from St. Johns and the airport, this little cottage inn reflects the true spirit of Caribbean architecture and outdoor living. Palm + Frangipani Cottage is a two bedroom cottage with access to the swimming pool on the property. 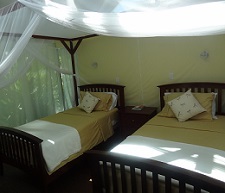 The master bedroom called Palm Cottage, has a four poster king size bed, indoor and outdoor shower, air-conditioner, ceiling fans, two cable TVs and internet access. It also has separate living room/kitchen and large patio with outside dining table. 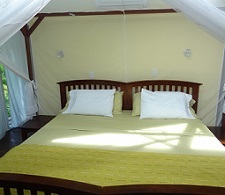 The second bedroom called Frangipani Room, has its own bathroom, air-conditioning, cable TV and internet. Is it adjacent to the main cottage and can have a king or twin beds. This makes it ideal for families or two couples sharing. Coco Cottage is a one bedroom cottage with a four poster king size bed along with an indoor shower as well as an outdoor courtyard shower. It has its own kitchen/living area and outside dining table. Bedroom has air-conditioner and ceiling fan, cable TV and internet. 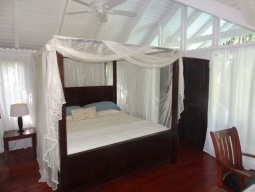 The Flamboyant Cottage has two air-conditioned bedrooms each with its own bathrooms. It has a separate kitchen, sitting and living area with ceiling fan, cable TV and internet. Contact us for enquires at lejardincreole@candw.ag or tel: 268 464 7576 /268 561 1835.